Submit your expenses to move them to the next stage in the process. Any created expenses will be stored in your Draft Expenses section. 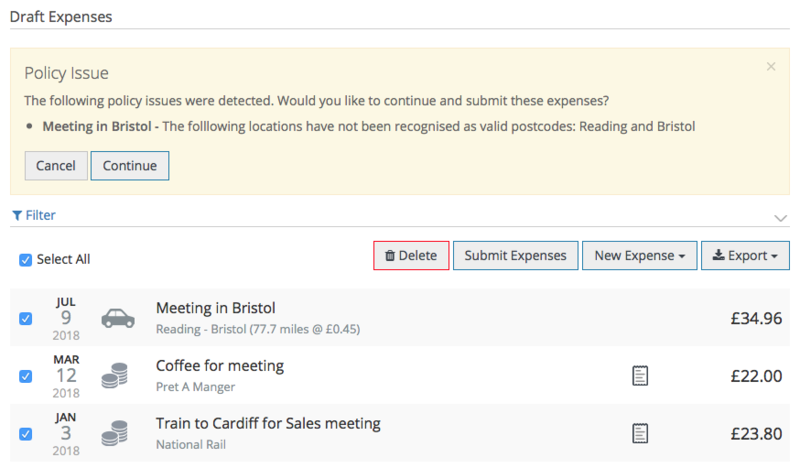 Select the expenses individually or tick the Select All box to select all of the expenses. If any policy issues have been detected with your expenses a warning will appear. This warning will state what policy the claim is in breach of. Providing your policy is "warn only" you can still submit your expenses by clicking Continue. If you have any blocks enabled on your policy, the system will not allow you to submit these expenses. If you are part of an approval flow the expenses will be sent on for approval. If not, then your expense will be immediately shown as approved and will be stored in the Approved section.